Last January I wrote that Birgit Nilsson considered Erik Sjöberg one of her three favorite tenors; the other two were Gigli and Di Stefano. I had never heard of Sjöberg and asked if anyone reading the piece could supply some information about the Danish singer. Several months later I was contacted by Torben Sjöberg, the late tenor’s son. He sent me a biographical sketch and several CDs of his father’s singing. The following is adapted from the material he generously gave me. Erik Sjöberg was born on October 31,1909 in Nexø on the island Bornholm in The Baltic Sea. He died in Rønne, Bornholm November 8 1973. After finishing school he was a shoemaker for seven years. Fond of singing, a friend arranged an audition for him in Copenhagen. Vilhelm Herold the noted Danish tenor and leader of the Opera School in Copenhagen offered him a scholarship and he joined the Royal Opera School in Copenhagen. Like many tenors he started as a baritone. Herold’s most famous student was Lauritz Melchior who also started as a baritone and debuted in the same opera house and in the same opera as Sjöberg. 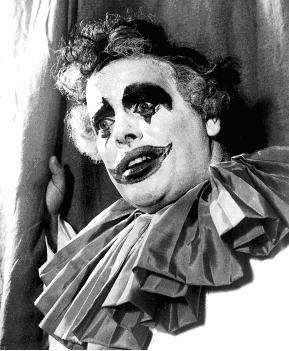 Sjöberg made his debut at The Royal Danish Opera in May 1937 in Pagliacci. He sang both Tonio and Silvio in Leoncavallo’s opera. During the next six years he sang mainly small baritone roles He was Jake in the first Porgy and Bess performed by white singers. Other roles that followed included Pedro in Tiefland, The Fisherman in Stravinsky´s The Nightingale, Don Carlos, David in Carl Nielsens opera Saul and David , and Canio in Pagliacci. 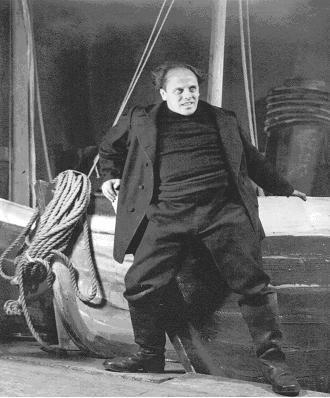 In 1947 he was the first Danish Peter Grimes. 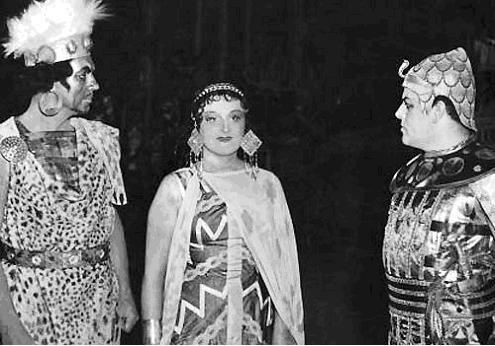 He sang Fenton in Falstaff, Radames in Aida (also in Stockholm 1951 with Birgit Nilsson and Sigurd Björling – below). It was these Stockholm performances that so impressed Nilsson. He also sang Max in Der Freischütz, Walter von Stoltzing in Die Meistersinger, and Lohengrin. 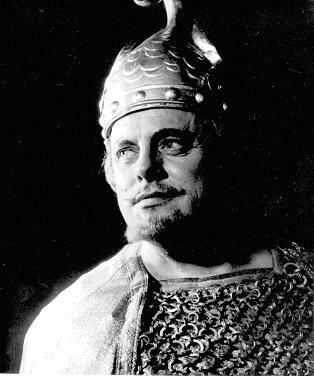 His last performance in Copenhagen was Bacchus in Ariadne auf Naxo in 1959. He sang Lohengrin in France (Lyon and Toulouse) with the young Georges Petre as conductor. 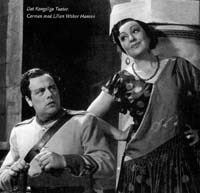 He also sang Lohengrin in Rome under Franco Capuana with Antonietta Stella as Elsa. He gave concerts in Norway, Sweden, Germany, Holland (with The Concertgebouw under Erich Kleiber) and in France. He sang a Wagner concert in Cannes with Martha Mödl. He also appeared in oratorios in Denmark and Sweden. He was appointed Kammersanger (Royal Court Singer) in 1951. He only made a few recordings. Beethoven’s 9th under Fritz Busch has been released on CD. In 2005 a 1953 performance of Lohengrin from The Royal Danish Opera was released conducted by Erich Kleiber. In 2006 a portrait CD “Den glemte tenor“ (The forgotten tenor) was released containing folksongs in his native dialect from Bornholm. The disc also includes Danish songs and romances and arias all sung in Danish. From the material I have he seems to have been at his best between 1947 and 1953. Thereafter his high notes become strained and the hint of vocal unsteadiness that was always apparent becomes more pronounced. His middle voice hints at his baritone origin. Here’s the last part of the Nile Scene from Aida recorded in 1950, the year before he appeared with Nilsson. He handle’s the scene’s difficult last line with ease and power. The Gondola Song from Strauss’s A Night in Venice shows the tenors ability with a long vocal line as well as a little unsteadiness. But if you’re still mystified why Nilsson put Sjöberg in the same class with two of the greatest tenors who ever lived the best I can offer are two excerpts from Act 1 and Act 3 of Lohengrin from a 1953 performance in Copenhagen. Here Sjöberg produces beautifully modulated tones along with a bright sound and ringing high notes. His career was short because he started late and finished relatively early. His debut as a tenor was at age 35. He retired at 50. Whether he retired because of vocal problems or for other reasons I do not know. In summary, I think this was a singer who didn’t deserve the total obscurity he fell into after his retirement and death. He’s clearly better than a lot of more widely known artists. I suspect he was an uneven performer who on his best nights was very good. He likely brought lightness and lyricism to Wagner rather than the typical gruff barking too often associated with that composer. I found his work very pleasing. Make up your own mind. I like him in the different excerpts, except for the Aida end of act. It is quite ordinary. Very smooth…..lyric quality. Bet he’d sound even better in Italian.